I've just been capturing my whole screen at 1920 x 1080 @ 30 fps. The quality of the WMV that was saved doesn't seem too bad, although I'd prefer one of the more versatile formats. However I can't find any way to change the capture format. Nor can I find any Help system for 'Record Your Screen' [VSSCAP.exe], nor can I find anything in the Learning Center. Perhaps the inclusion of this in the NXT 3 suite was a last-minute afterthought? 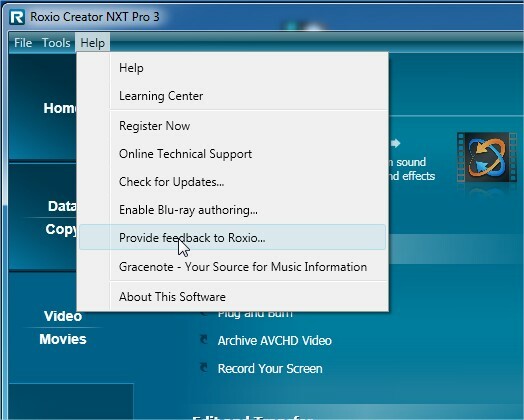 I do not understand why ROXIO does not provide a comprehensive specification for this new SCREEN CAPTURE. The ROXIO designers have all the answers to our questions. I beg them to provide officialy the spoecification pf this SCREEN CAPTURE. But I amnot sure they will listen to me!!!!!!! They won't listen to you here because apart from one overworked serviceman they never come here. However there is the Feedback option under the Help button at the top of your main menu screen. Click that 'Provide Feedback' item and send it to Roxio. Note that it's not the place to ask for help, but it's certainly the place to point out shortfalls in the software. Tell them about it. I'm not at my computer where I have NXT 3. Since it is really a Corel application, perhaps this tutorialmight help (maybe a tip or two). The one in NXT 3 may be a cut down OEM of the program in the Corel product. EDIT: I just got to my other computer and confirmed that only wmv is available. It captured at the maximum resolution of my desktop (1080 by 900). There are very few other controls.available so it seems like the program is a cut down version of an OEM. So this "Wonderful addition" is really only another diced-and-sliced, dumbed-down, surgically castrated remnant of another product, like the Creator Red Box? Sigh . . . . I think it is worst than that ! This one doesn't work at all under Windows XP.! If a product is advertized to work under Windows XP, it should work under Windows XP, regardless of your opinion of Windows XP. ...regardless of your opinion of Windows XP.